In 1966 I enrolled at Carnegie Institute of Technology (now Carnegie Mellon University) to begin an undergraduate program in Mathematics. When I arrived in Pittsburgh that fall I noticed the trolleys that went right by the school and even rode them to and from downtown Pittsburgh a few times, but I was busy getting acclimated to college and did not spend much time thinking about them. Alas, just four short months later, in late-January 1967, all of the lines that went past Carnegie Tech and a lot of others were shutdown in favor of buses. All that remained were lines that served the South Hills, and at the time the South Hills might just as well have been Mars (a Northern suburb of Pittsburgh, though I didn't know it at the time) to me. May 25-26, 1974: Pittsburgh Traction Weekend will be sponsored by Central Electric Railfans' Association. 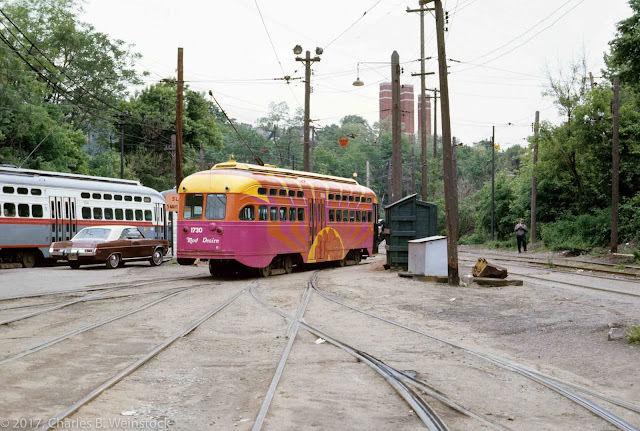 ... Sunday: Entire rail system of Port Authority of Allegheny County will be covered in a day-long trip using three differently painted PCC cars in sequence. Photo opportunities will include work equipment. July 4-7, 1974: The Independence Limited runs again! Southern steam locomotive 4501 will head special through Ohio, W. Va and Va. July 4: Cincinnati to Williamson via N&W mainline. 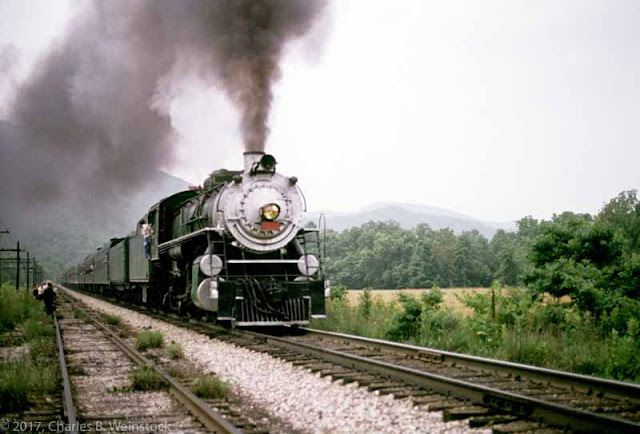 July 5: Williamson to Roanoke via former Virginian trackage. 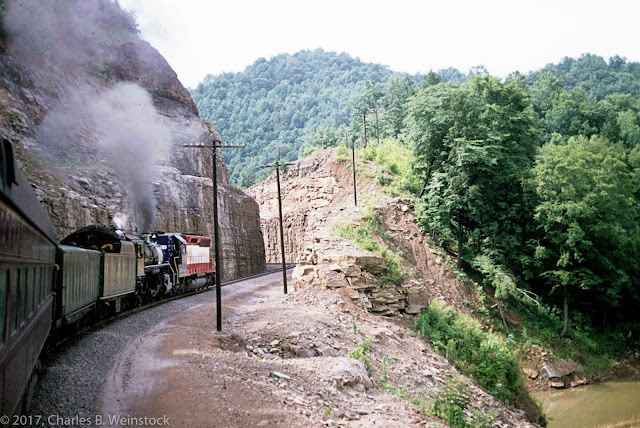 July 6: roundtrip between Roanoke and Buena Vista on N&W Shenandoah Division. 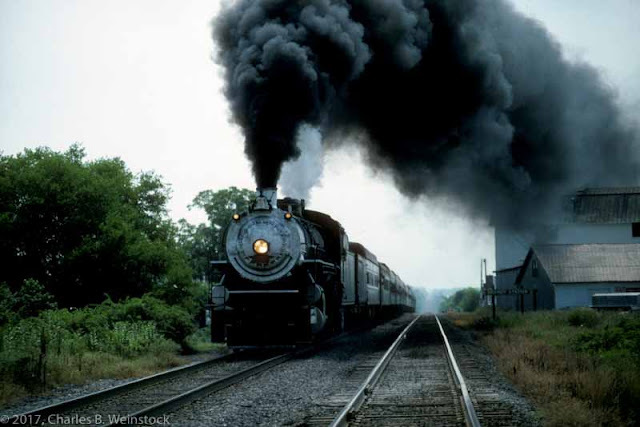 July 7: Roanoke to Alexandria via Southern mainline. Intermediate stops. Overnight accommodations. Return transportation from most points. For information write Roanoke Chapter, NRHS. One night in one of the finest hotels in Williamson, W. Va.
all for the price of $120 inclusive (about $600 today). Of course I had to get from Pittsburgh to Cincinnati on July 3. Flying was an option as was, I suppose, a long bus ride, but it turned out that a fellow grad-student, Paul Knueven, grew up in Cincinnati and he and his wife were going to be driving there for the holiday weekend. They invited me to hitch a ride, and Paul's parents even put me up for the night in a guest bedroom. We all went out for my first taste of Cincinnati-style chili that night and they gave me a grand tour of the area. (Not a fan of Cincinnati-style chili though.) The next morning Paul and his dad drove me to the train and I had my first glimpse of 4501, a locomotive I would see many times over into the 21st century. The first sniff of coal smoke from the old Mikado brought me immediately back to being four years old and picking my Dad up at the Chicago & North Western's Ravinia station as he got off his Pacific-pulled commuter train. 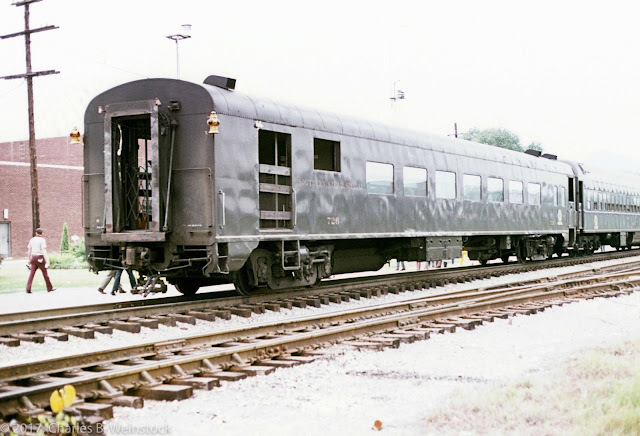 As a through passenger (that is, riding all the way from Cincinnati to Alexandria) I was entitled to ride in the air conditioned combine "Man O' War". A combine is a half baggage - half coach and this one, a staple on Southern steam excursions, was named after a train of the same name that ran on the Central of Georgia and still lettered for CofG, which in turn was named after one of the greatest thoroughbred horses of all time. The Man O' War ran at the front of the train (behind the gondola they used to transport coal for the locomotive, and the Norfolk and Western business car 500, Claytor Lake). The doors in the baggage portion of the car made for a great place to take pictures. (These sorts of pictures are becoming increasingly harder to get because of railroad policies prohibiting open vestibule windows, etc.) , The Man O' War was also the place to make (audio) recordings of the 4501 in action. I also had access to the rest of the train, and could have ridden anywhere else I wanted. As the trip began I settled into my seat and took note of the other passengers in the car. I remember most, an old man (probably younger than I am now) named Lex who was from the Cincinnati area and pretty much an "expert" on everything. One of the things he was an expert on was beer, and he was raving about Hudepohl beer and how he planned to have some during the lunch stop in Portsmouth. He was a real character. Another was the late Bob Bixler from Orrville, Ohio, who became a friend. He was an ex-Pennsy fireman and was traveling with his very young daughter and her friend. Bob and I kept in touch over the years, and I would occasionally see him in Pittsburgh when he would come to town on an Orrville Railroad Historical Society excursion that he had organized. Once when he ran two back to back excursions to Pittsburgh he let me ride the trip in reverse (from Pittsburgh to Brewster, Ohio one train, and returning on the next day's train), he even lent me a car for the evening I was in the Brewster area. Then there was a pretty young woman, Aleatha Brock, daughter of Paul Brock, who was working in the cab of 4501. Finally, I remember that this is where I met Bruce Heard, another person who became a good friend. Bruce worked for Amtrak in various capacities, at corporate headquarters in DC when I met him, but retiring as Senior Director of Special Projects (read--interfaced with Hollywood I believe) in California. My good friends Dave and Carol Ingles were aboard, but I was not to meet them until the following year. This was really near the beginning of when I started to get serious about railroad photography. In those days I traveled with two Canon FTb 35mm SLRs. One held black and white Tri-X (usually) and the other color slide film Kodachrome 64 (usually). I spent a lot of time in the baggage section of the Man O' War taking pictures. It wasn't until much later that I realized that I (mostly) did not like the pictures that resulted from shooting the train in this manner. One really has to be pretty far back in a long train for this to be worthwhile. Another thing I learned about this first day of the trip was cinders, and how they enjoyed finding your eyes. Luckily the concession car (Carol E. Jensen) in the middle of the train had safety glasses for sale along with ample amounts of food. The car, by the way, was named for the wife of Carl Jensen who was a leader of the Roanoke Railroad Historical Society. I met both of them on this trip along with other members of the group who I would come to know better over the years including David Helmer and Dorr Tucker. Continuing on with photography, this trip also introduced me to the photo runby. The trolley trip a few months earlier had provided photo opportunities in which we could all get off the trolley and take pictures of it in various locations and with various sign boards showing. For a main line train excursion a photo runby is much the same...only more so. The train stops, the passengers who are interested (most everyone) get off the train and find a good position for taking pictures, the train backs up out of sight and then comes forward at high speed with lots of smoke and whistling. It may do this again (a double runby) or it may just back up and pick up the passengers and continue on its merry way. The pictures obtainable at a runby are generally vastly superior to those obtained out a vestibule window. We had several runbys each day of this four day excursion. Late in the day we crossed into West Virginia at Kenova and the territory became more rugged. People came through the train and passed out hotel room assignments and keys, and told us that dinner options would be limited in Williamson but that a restaurant, The Lock Stock and Barrel, would remain open for us and serve a special buffet. The restaurant was founded by some anti-poverty activists and was part of a rehabilitation effort in Williamson. But in order to eat there, we first had to get to Williamson. We were chugging along nicely until all of a sudden the train came to a complete stop. It seems that the 4501 had developed a clinker. This was the first I had ever heard of a clinker -- a hard deposit that occurs when ash and sulfur fuse together. This happens when the firebox is at a lower temperature than normal. In order to proceed the clinker had to be broken up (using a tool called a clinker hook). In due course it was, and we eventually pulled into Williamson. According to Wikipedia: When dignitaries such as President John F. Kennedy and First Lady Eleanor Roosevelt, entrepreneurs such as Henry Ford and celebrities such as Loretta Lynn and Hank Williams came to the area, they stayed at the Mountaineer Hotel. Oh, and me too! This was (and is now even more so) an OLD hotel with smallish rooms, but reasonably clean. The first thing I did was to take a shower, whereupon I learned the reason that railfans often wear hats -- to avoid cinders in their hair. I hardly ever wear a hat because usually they are too small for me, and besides, I had (and have) a good head of hair. It must have taken me a good 10 minutes to wash all the cinders out of my hair. (I bought and wore a hat the next day.) Oh, and riding behind a coal powered locomotive and hanging out the window is dirty work. I used up a lot of water. So did everyone else in the hotel. I heard that latecomers had a real problem with both hot water and water pressure by the time they got to the shower. After changing, it was off to the Lock Stock and Barrel for dinner. The only thing I really remember about the dinner is that most of us felt that we had been taken lock stock and barrel by eating there. It turned out that there were other options that proved more satisfying to those who partook of them. On the way back to the hotel some of us stopped to admire the Coal House a building made entirely of coal that housed the chamber of commerce. The scenery became even more rugged and we were helped along by Norfolk and Western SD45 diesel locomotive 1776, all painted up for the US's bicentennial two years hence. As we approached Elmore Yard and Mullens, W. Va. someone on the train mentioned that the Regency Room at the Hotel Roanoke was the place to dine well in Roanoke, especially to savor their famous peanut soup--but only if you wore a jacket and tie. I have no idea why I had a jacket along (I wouldn't these days), but I did not have a tie. So I used part of the time we were in Mullens walking around the downtown area and bought myself a cheap ($5 as I recall) tie at the Mullens G.C. Murphy. We pulled into Roanoke at an early hour. As they had the afternoon before, the Roanoke Chapter people had distributed hotel room keys on the train, so it was simply a matter of getting of the train, walking by the Raymond Lowey designed passenger station and up the hill to the Hotel Roanoke and finding my room. Again an old hotel, but an elegant one. After a shower (with much fewer cinders because of my nice and shiny new hat) it was time for dinner in the Regency Room. It was as elegant as promised with white jacketed waiters and great food -- particularly the peanut soup. The next day I could leave my stuff in my room, because the the train was doing a round trip to Buena Vista on the Shenandoah line. This was a pleasant journey punctuated by a picnic on said vista looking down upon the city and the train below. The last day of the trip was a shot up the N&W to Lynchburg and then up the Southern all the way to Alexandria, Va. As usual there were runbys and lots of high speed running and it was a grand old time. Throughout the trip I had been eyeing the Claytor Lake, the business car running ahead of the Man O' War. At some point I mentioned my interest to Bob Bixler who pointed to another gentleman who was spending time in the Man O' War, Jim Bistline, and said that he'd probably be willing to take me up to look around. Jim, it turned out, was the General Counsel for the Southern Railway and also one of the leaders of the Southern Steam program. He was delighted to give me a tour and we became good friends in the ensuring years as we got to know each other better. It was a sad day when he passed away. Eventually the train pulled into Alexandria, and I had to get back to Pittsburgh. Again, I could have flown, or waited a day and taken the train, but I had a better idea. It turned out that several fellow grad students including my Norwegian friend Amund Lunde (who we used to call a "damn Swede" because it annoyed him so and who was one of my few non-native English speaking friends who could pun in English) wanted to visit DC over the holiday. I gave them the use of my Volvo as long as they agreed to pick me up in Alexandria. They did, and I was home that same evening, a confirmed train-riding railfan.